Order the current issue, back issues, and subscriptions at the IRAAA online store. The Spring 2013 issue of the IRAAA on popular culture, digital technology, and mass media spotlighted science fiction as a significant influence in contemporary African American art. 1 So it is not surprising that the exhibition Approximately Infinite Universe includes several artists of African American descent: Edgar Arceneaux, Simone Leigh, Jacolby Satterwhite, Cauleen Smith, and Saya Woolfalk. Organizing the exhibition, curator Jill Dawsey selected art works that employ sci fi tactics to critically address contemporary issues. Many of the works cite the writings of Octavia Butler, Samuel R. Delany, and Ursula K. Le Guin. While comic superheroes are scarce, transmogrification and terrestrial appropriation are on display in the primarily earthbound works. Drawing on science fiction in various ways, the works of the African American artists display a range of field with respect to racial identity. On this matter, the exhibition refers to Mark Dery’s “Black to the Future: Interviews with Samuel R. Delany, Greg Tate, and Tricia Rose”. 2 In the prologue to his interviews with these writers, Dery posits the intrinsic appeal of science fiction to African Americans: Didn’t the African American experience begin with abductions by aliens to a strange land? 3 Edgar Arceneaux’s The Slave Ship Zong (2011) seems to explore this history. 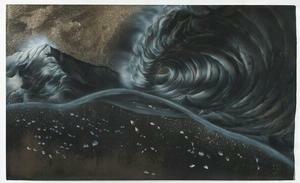 Arceneaux creates an immense black and grey wave below which disembodied eyes populate the water. However, the painting does not show the drowned slaves of the overloaded, colonial ship; but their progeny, wholly adapted to their ocean home. Fiction, after all, is an alternative to fact. Cinqué Hicks has cited Dery’s “Black to the Future” as introducing the term “Afro-futurism” into print in the 1990s. Hicks defines Afro-futurism as use of “technology and elements of science fiction to express African American experiences of alienation, difference and cultural strangeness.” 4 Within the exhibition, Cauleen Smith’s Afro-Futurism Tapes 1998-2008 most closely adheres to Hick’s characterization. In one piece, technology, in the form of a video camera, serves as a somewhat inadequate tool for the black protagonist to overcome temporal estrangement. Hicks explains this reliance upon technology to elaborate a modern identity to be of a particular moment, now past. According to Hicks, though conceptualized during “the multiculturalism of the 1990s, [Afro-futurism] took notions of black identity more or less as they had been formulated in the 1970s and ‘80s and left them largely undisturbed.” 5 The disruption of these earlier notions is apparent in works by Simone Leigh. Drawing from various icons (including Uhura of Star Trek), Leigh offers nostalgia for these repositories of black identity. Her Brooch #2 (2008), an assemblage of metal-plated ceramic bananas set in a circular armature, could be a DIY rocket-launcher or shield. At the same time, the work converts the traditional African food staple into a totem. In “Black to the Future”, Dery was in effect asking why there were not significant numbers of African American fans and writers of science fiction. The interviews suggest that Dery mistook invisibility for disinterest. Today, as noted in a recent article in the Los Angeles Times, African Americans in the science fiction community are more visible and vocal. 6 What does this recognition of the genre’s appeal mean for artists? It not only validates science fiction as a creative mode but also provides for common references. In Detroit Monolith, It’s Full of Holes (2011), Arceneaux depicts a key site (indicated by the inclusion of an unofficial memorial sculpture) of the 1969 Detroit Riots. Looking at the painting, one might wonder, where are the black people? 7 In this way, the painting suggests the riots as the beginning of the dissolution of the entire city –its population, edifices, freedoms – at a future time made clear by geologic and solar changes. 8 Far from an exclusionary theme, black subjectivity offers entry into a grand narrative of Detroit. In considering the trajectory of Afro-futurism in the article “Gallery Universe: a multidimensional fantasy trip”, Toni Wynn makes clear that its characteristic elements —masquerade, DIY, performance, and archeology— form links to African traditions and have persisted in art made by African Americans. 9 Drawing on the performative, Jacolby Satterwhite takes his own voguing as a departure point for a meditation on creative expression. Subjected to 3-d modeling software, drawings by his mother form a kind of fairground for dancers in bodysuits. While comprising an unexpected allegory of corporate gluttony, the allure of Country Ball 1989-2012 comes from its more personal aspects. Saya Woolfalk takes a similarly personal and fantastic approach to her work, though to very different ends from Satterwhite’s. Woolfalk, who is of African American, European American, and Japanese descent, gives attention to the performative and handcrafted in her work. Rather than genetic technology, she uses an anthropological lens to develop her project "The Empathics" which describes the evolution of a group of humans metamorphosed by their incorporation of plant genes. The closest things to superheroes on display, the Empathics, when completely transformed, are literally dual-minded. According to accompanying texts, the displayed paintings, or “pages”, were completed by Empathics during a spiritual visioning ceremony. With borders of clouds, palm trees, and rainbows, the paintings meld disparate scientific and cultural imagery. 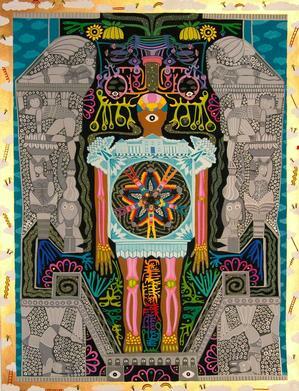 The forms of Pollinators and Plants (2011) reference pollination, neurology, Aztec ceremonies, and Japanese kawaii("cute")illustration. In its entirety, Approximately Infinite Universe takes on a range of topics including corporate cooptation, political disenfranchisement, and unseen forces relating to the housing mortgage crisis. 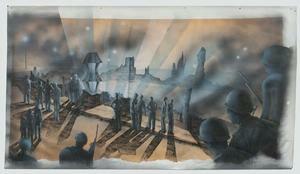 The works also articulate a range of identities through the vantage points of science, history, and culture. Foregoing a unifying stylistic premise, the selection of works feels eclectic. Within this assortment, however, the curator achieves her stated aim of presenting artists who employ science fiction as a means of critique. In doing so, Approximately Infinite Universe demonstrates that science fiction remains a relevant platform for conceptualizing a broad expanse of African American experience. Elizabeth A. Watson writes about art and architecture in San Diego, CA. 1 International Review of African American Art (IRAAA) 24:2. 2 Cited in a wall text by Kelly Gabron associated with Cauleen Smith’s work. Mark Dery, “Black to the Future: Interviews with Samuel R. Delany, Greg Tate, and Tricia Rose”, reprinted in Flame Wars: The Discourse of Cyberculture”, ed. Mark Dery (Durham and London: Duke University Press, 1994), pp. 179-222. 3 Dery, “Black to the Future”, 180. 4 Hicks, “Circuit Jamming: Artists doing digital media now”, IRAAA 23:3, 3. 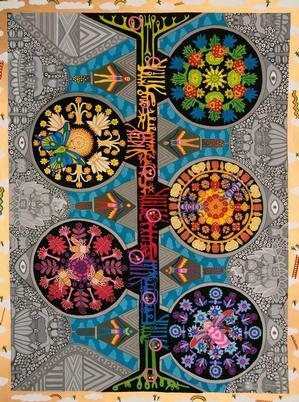 6 Mindy Farabee, “As Diverse as the Realms Explored”, Los Angeles Times 14 June 2013, D14, D15. Online as Mindy Farabee, “Beyond ‘Game of Thrones’: Exploring Diversity in Speculative Fiction”, Los Angeles Times (June 9, 2013). http://herocomplex.latimes.com/beyond-game-of-thrones-exploring-diversity-in-speculative-fiction/#/0 (accessed July 24, 2013). 7 Arceneaux referenced the theme of the absence of blacks in much of science fiction in “An Artist’s Perspective” panel at the MCASD, June 8, 2013. The representation of race in the future is a recurring topic of contention within science fiction. It is discussed in both “Black to the Future” and “Beyond ‘Game of Thrones’”. 8 The city’s financial dissolution has occurred; Detroit filed for bankruptcy on July 18, 2013. 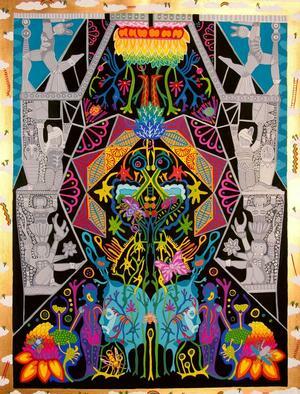 9 Toni Wynn, “Gallery Universe: a multidimensional fantasy trip”, IRAAA 24:2, 29-38. ©2019 International Review of African American Art. All Rights Reserved.